Roadcraft refers to the system of car or motorcycle control outlined in two books Roadcraft: The Police Driver's Handbook and Motorcycle Roadcraft: The Police Rider's Handbook. The books are produced by the Police Foundation and published by The Stationery Office. 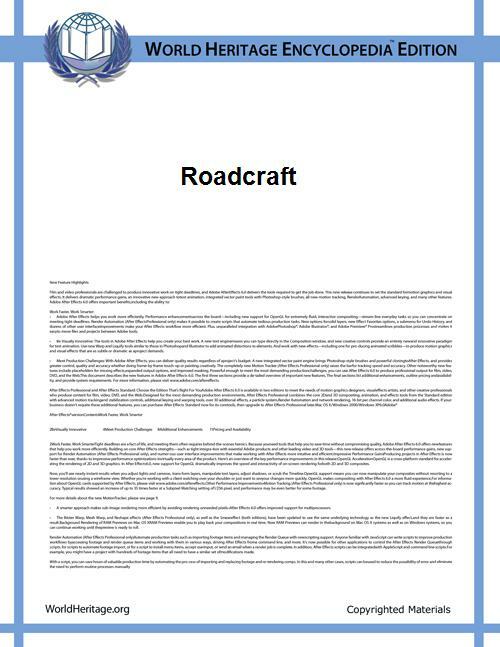 The official Roadcraft website provides further information about the Roadcraft handbooks, their history and how they were published. Acceleration for clearing the hazard safely. The taking, using and giving of Information is, arguably, most important and surrounds (and drives) the five phases IPSGA. It may, and often should, be re-applied at any phase in the System. The System is used whenever a hazard requires a manoeuvre. A hazard is something which requires a change in speed, direction or both. The benefit of applying a systematic approach to driving is to reduce the simultaneous demands on the vehicle, the driver mentally and the driver physically. That is, the System seeks to separate out the phases of a manoeuvre into a logical sequence so that the vehicle and the driver avoid being overwhelmed by having to do too much at the same time. For example, braking and steering at the same time place greater demands on the vehicle's available grip and in the worst case can lead to a skid. Whilst the books were originally put together at the RoSPA and the Institute of Advanced Motorists base their teaching and advanced motoring tests on Roadcraft. ^ Mares, Penny; Philip Coyne; Barbara MacDonald (2013). Roadcraft: The Police Driver's Handbook. ^ Mares, Penny; Philip Coyne; Barbara MacDonald (2013). Motorcycle Roadcraft: The Police Rider's Handbook. ^ "Official Roadcraft website". Police Foundation. Retrieved 19 August 2013.